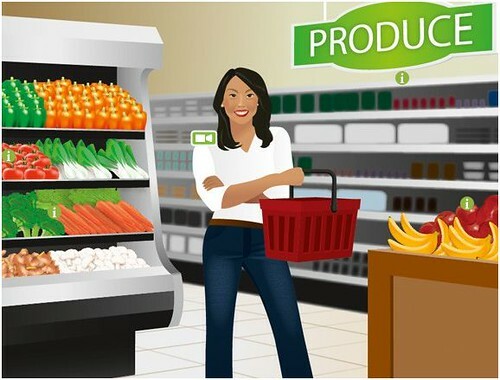 A new virtual grocery shopping tool designed by provincial nutritionists in collaboration with major B.C. grocery retailers is helping British Columbians make the best food choices for their families. Statistics Canada released its annual Canadian Community Health Survey confirming that B.C. still holds the top spot among provinces when it comes to living healthy lifestyles. 30 Minute Meals 101 Quick-Fix Recipes – Includes Easy Dinner / Lunch Recipes, and Simple Healthy Recipes that can be made in 30 Minutes or Less for Busy Moms, Working Dads and Busy Families! Simple cooking steps to go from Stove to Stomach – your busy life just got easier. Here are 101 simple and delicious quick and easy meals that each take less 30 minutes. What you’ll find here is a collection of unique, original, and traditional recipes that were recreated to be made in 30 minutes or less, and still taste great! Oh, and they don’t need any exotic ingredients or special kitchen tools to make. Are you ready for good food fast? I hope so…enjoy! P.S.- What will you do with all your free time? Transit to Trails allies including the National Park Service teamed up with PBS, KCET, and Nike on August 1 at the Ricardo Montalban Theater in Hollywood to view clips from the Untold Stories Project as part of the roll out of the upcoming documentary National Parks: America’s Best Idea by Ken Burns premiering on September 27, 2009, on PBS. Transit to Trails takes inner city youth and their families and friends on fun and educational mountain, beach, and river trips to enrich their education about water, land, wildlife, and cultural history, and the importance of physical activity and healthy eating for life-long health. 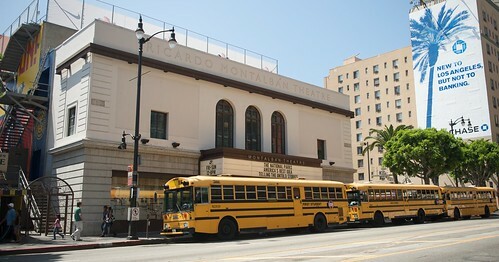 Transit to Trails buses took inner city families from Northeast L.A., East L.A., Pico Union, and the Gateway Cities to the Montalban Theater, where over 500 audience members were greeted by the sounds of singing crickets and a virtual crackling campfire on stage. Short documentary clips chronicled city kids in Death Valley National Monument and Buffalo Soldiers in Yosemite National Park. 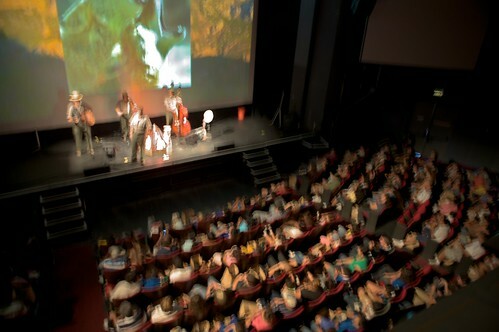 National Park Rangers led the audience in campfire singalongs. Three L.A. high school students presented their work on the Los Angeles River webstory by KCET’s Juan Devis. Although children in Transit to Trails programs live only an hour from the mountains and beaches, many have never been there, because parents often work two or more jobs, and do not have access to cars or to information to plan trips. Transit to Trails is diversifying access to and support for mountains, beaches, and rivers — and having fun hiking, biking and swimming while doing it! 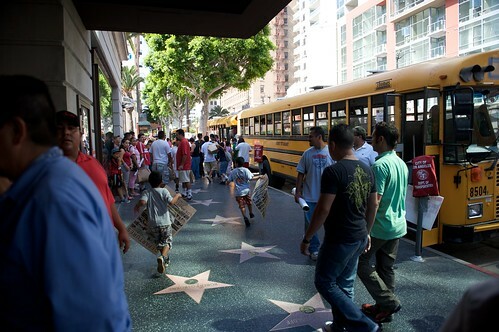 Audience members will have the opportunity to get on the bus, venture beyond the L.A. city limits to the Santa Monica Mountains National Recreation Area and other park lands and engage different projects including a beach trip to Leo Carrillo State Park and a stewardship project in Zuma Canyon. “Transit to Trails makes it possible for our youngsters to visit mountains, beaches, and rivers and to learn about the National Parks. Thank you to everyone who made this happen,” said Raul Macias, founder and president of Anahuak Youth Sports Association, who brought hundreds of participants on MRCA buses. Transit to Trails is a creative partnership between Anahuak, The City Project, Mountains and Recreation Conservation Authority (MRCA), National Park Service, Oldtimers Foundation, CORBA (Concerned Off Road Bicyclists Association) and others. 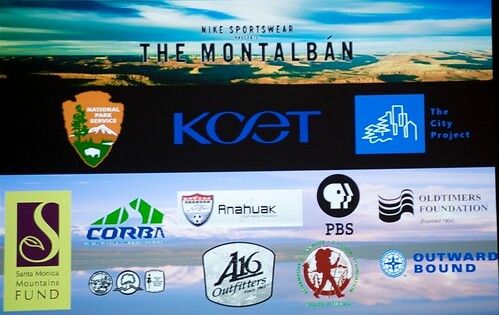 The screening at the Montalban Theater was made possible in part by the generous support of Nike, A16 Outfitters, Santa Monica Mountains Fund, and Outward Bound L.A.
Click here to download the Transit to Trails Policy Brief. For more coverage visit the National Parks web site and the Examiner. The six-episode, twelve-hour series National Parks: America’s Best Idea, at its heart, is the story of an idea, as uniquely American as the Declaration of Independence and just as radical –- that the most special places in the nation should be preserved, not for royalty or the rich, but for everyone. PHOTO CAPTION: View of the new Fort Greely Community Activity Center, Alaska. The menu will include regional favorites such as reindeer sausage and bison burgers, but will also include American favorites such as pizza and Philly Cheesesteak sandwiches. The new center will have food, bowling, arcade and game activities, meeting rooms and Wifi.